Alkaline water Standing alone, the hydrogen atom contains one positive proton at its core with one negative electron revolving around it in a three-dimensional shell. Oxygen, on the other hand, contains 8 protons in its nucleus with 8 electrons revolving around it. This is often shown in chemical notation as the letter O surrounded by eight dots representing 4 sets of paired electrons. "B grabs an electron from molecule A. "Molecule A has been oxidized because it has lost an electron. "The net charge of B has been reduced because it has gained a negative electron (e-). "In biological systems, removal or addition of an electron constitutes the most frequent mechanism of oxidation-reduction reactions. These oxidation-reduction reactions are frequently called redox reactions." "An acid is a substance that increases the concentration of hydrogen ions (H+) in water. A base is a substance that decreases the concentration of hydrogen ions, in other words, increasing the concentration of hydroxide ions OH-. "The degree of acidity or alkalinity of a solution is measured in terms of a value known as pH, which is the negative logarithm of the concentration of hydrogen ions:"
"On the pH scale, which ranges from 0 on the acidic end to 14 on the alkaline end, a solution is neutral if its pH is 7. At pH 7, water contains equal concentrations of H+ and OH- ions. 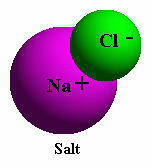 Substances with a pH less than 7 are acidic because they contain a higher concentration of H+ ions. Substances with a pH higher than 7 are alkaline because they contain a higher concentration of OH- than H+. The pH scale is a log scale so a change of one pH unit means a tenfold change in the concentration of hydrogen ions." "Living things are extremely sensitive to pH and function best (with certain exceptions, such as certain portions of the digestive tract) when solutions are nearly neutral. Most interior living matter (excluding the cell nucleus) has a pH of about 6.8." Such free radicals with unpaired electrons are unstable and have a high oxidation potential, which means they are capable of stealing electrons from other cells. This chemical mechanism is very useful in disinfectants such as hydrogen peroxide and ozone which can be used to sterilize wounds or medical instruments. Inside the body these free radicals are of great benefit due to their ability to attack and eliminate bacteria, viruses and other waste products. The Ionized water is the product of mild electrolysis which takes place in the ionized water unit. 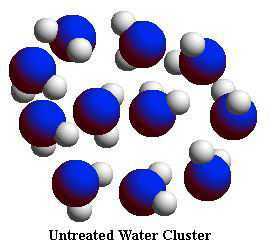 The production of ionized water, its properties, and how it works in the human body are described in the next section. Ionized water is treated tap water that has not only been filtered, but has also been reformed in that it provides reduced water with a large mass of electrons that can be donated to active oxygen in the body to block the oxidation of normal cells. "Undamaged biological molecules are less susceptible to infection and disease. 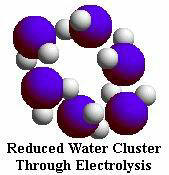 Ionized Water gives up an extra electron and reduces the active oxygen (AO), thus rendering it harmless. The AO is reduced without damaging surrounding biological molecules. Substances which have the ability to counteract active oxygen by supplying electrons are called scavengers. Reduced water, therefore, can be called scavenging water.